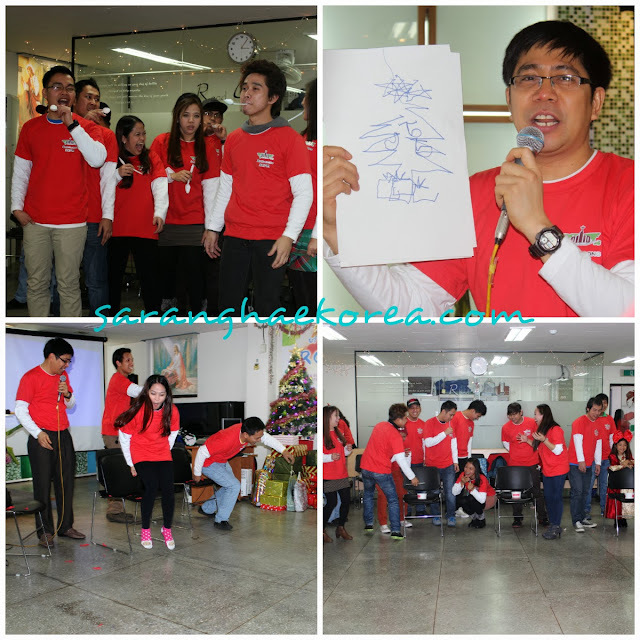 Do you ever wonder how Filipinos in South Korea, or abroad in general, celebrate Christmas? This year is my first year to celebrate Christmas away from home, let alone, away from my home country. I used to wonder what Filipino expatriates are doing during the Christmas season. Now that I am one of them, I have got the chance to get a glimpse of their way of commemorating the birth of our Saviour particularly here in South Korea. The celebration of Christmas is so special not to mention sentimental for the Filipino. This is the time of the year when family, companies, churches and communities in the Philippines gather together for a Christmas party. Here in abroad, the spirit of Christmas is alive, albeit the ambiance is quite different. Or I guess it is just me being nostalgic. 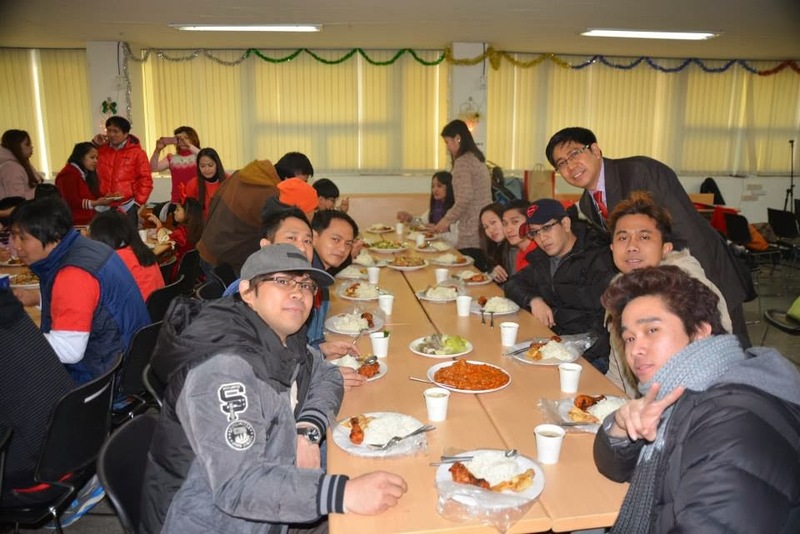 I had attended a Christmas Party of Sinwoldong Sungkyul Church Foreign Ministry (신월동성결교회), one of the many Filipino Christian Churches here in South Korea. 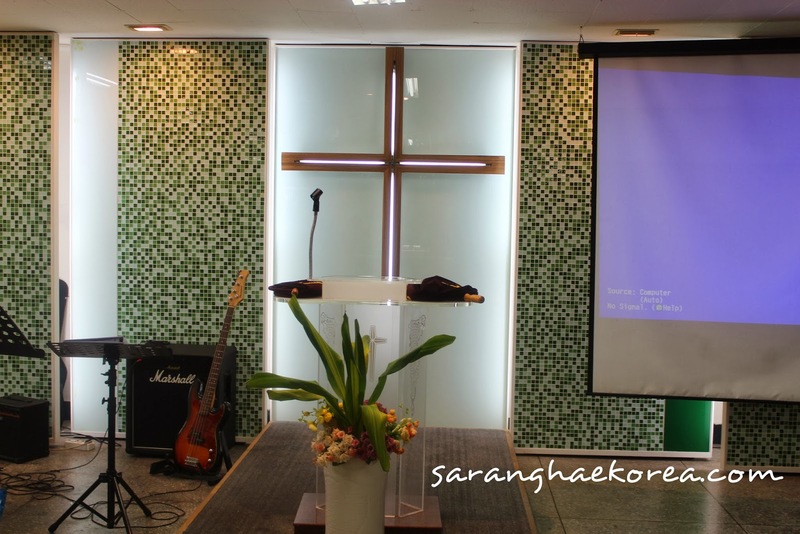 It is a small church community in Seoul ministered by Pastor Jerry Yusi and it has awesome members with positive energy and kind spirits. I love their community because they made me feel at home and everybody is just like fun to be with. So for anyone near Seoul or near that area looking for a church community to join with, feel free to join Sinwoldong Sungkyul Church Foreign Ministry every Sunday on their worship service. Just add their Facebook account to inquire for the exact location. During the Christmas Party, I temporarily forgot that I am in another part of the planet. 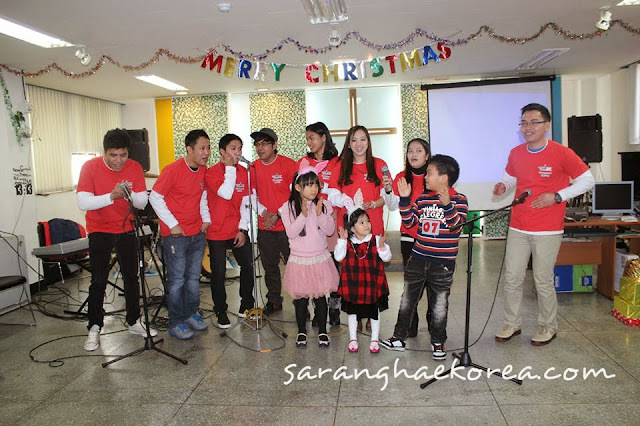 I felt like I am just celebrating Christmas in the Philippines because eventhough we are here in South Korea, we have celebrated Christmas in a Filipino fashion. The Pinoy trademarks are very apparent in the whole duration of the party. If you still ever wonder how pinoy abroad celebrate Christmas and how they integrate Filipino trademarks on this special event, let me show you a mini sample. I guess this is not only applicable in South Korea. I believe that all Filipinos around the globe are celebrating Christmas with traditional Filipino food on their table. Christmas is not without the usual food we see in the table of a Filipino family. At least it is this time of the year that we can keep ourselves away from kimchi and other spicy food. I think it’s strange to have Kamjatang or Samgyupsal in a Filipino style Christmas party. Christmas party is not without music for the Filipino. The likes of Videoke, caroling, Christmas cantata and whatnot are very apparent during this event. I think Filipino are musical in nature and you can’t get it away from them regardless of whether they are hitting the right note or not. I can’t think of a lively party without music though and I found out that group singing is more enjoyable than singing solo in the karaoke because in a group singing, you can go sharp or flat unnoticed. Parlor games are the King of the party for Pinoy because these make the celebration fun and lively. Whether the prize at stake is a crispy 50 pesos or one pack of candy, it doesn’t matter. It is innate for the Filipinos to be competitive; it is after all an honor and a pride to win a game. So even here in South Korea, we have played a lot of parlor games and yeah, it was fun. Yes you bet it, even in abroad, Filipinos do exchange gifts. I guess it’s a Christmas tradition that will never be eliminated from generation to generation. I think praying, singing songs of praise and giving worship to God will always be a part of Filipino Christmas Party. We are Christians after all, and if there are people who have really the right to celebrate Christmas, it is us the believer of Christ. What has gone wrong with Christmas is that, people tend to see it in the façade. They just want party, loud noise, gifts and the merriment brought about by Christmas. But we Christians know the real meaning and the important reason why we celebrate Christmas. Whether you are in the Philippines, in South Korea or in any part of the world, Filipino will always acknowledge the birth of the Saviour Jesus Christ. What I learned from my first celebration of Christmas here in abroad is that, our being Filipino will always remain in our hearts and minds. The things that we used to do during Christmas party in the Philippines will apparently manifest wherever we go. After all, nothing can beat the way Filipino celebrate Christmas party. 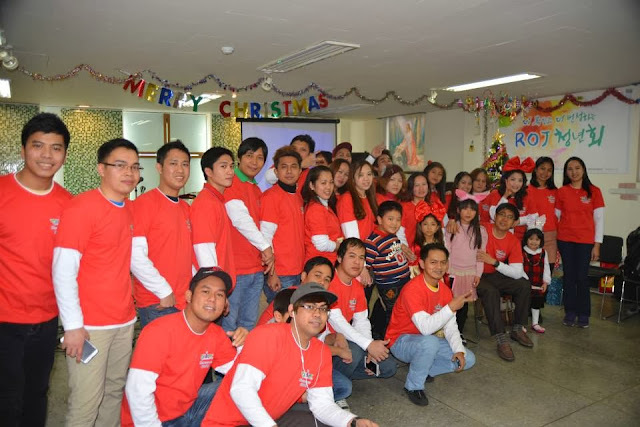 Nice to know that Filipinos in Korea are celebrating the joyous Christmas spirit. A tradition that can never be forgot for the passing of time and even in a far away place. Merry Christmas! I wonder it too! But one thing I know is that when Pinoys gather together especially in a celebration like Christmas, as you said will gather warmly and friendly forgetting that you are a stranger in that land. Good traditions are great. Food, Music, Games, Gifts and Worship does make Christmas spirit more felt even by Filipinos in Korea. It's heartwarming to know that Filipinos abroad, though far away from home, still get a chance to enjoy the traditional Filipino Christmas spirit. it was surprisingly !! And amazing ^_^ namamasko po ^_^ thank you thank you. Ang babait ninyo thank you. Thank you for this nice article bro.